Some 30,000 South African coal miners downed their tools on Oct. 4 over a wage dispute. This strike was organized by the National Union of Mineworkers (NUM), a key affiliate of the Congress of South African Trade Unions, which is an ally of the ruling African National Congress (ANC) party. NUM has blamed the mining firm bosses for the failure to reach an agreement acceptable to their rank and file. The owners submitted another offer on Oct. 9, a day after negotiations had broken down. The workers have walked off the jobs at mines run by Glencore, Anglo American, Exxaro and some smaller producers, threatening supplies of coal to the government-run power utility Eskom. South Africa, the most industrialized state on the continent, has been plagued by power shortages. The economy relies heavily on coal for its power generation, and South Africa is a major exporter to Europe and Asia. Two traditionally white-dominated unions in the coal sector, Solidarity and the United Association of South Africa, accepted the owner’s offer on Sept. 14. NUM, however, represents 72 percent of the workers in the coal mines, most of them African. This industrial action is taking place amid an economic slump in South Africa, a cause for concern for the ruling ANC government of President Jacob Zuma. With commodity prices declining worldwide, South Africa, along with other so-called “emerging economies,” is experiencing similar problems because of dependence on the generation of foreign exchange through exports of minerals and oil. A rival labor group, the Association of Miners and Construction Workers, is threatening to strike in the gold mines. On Oct. 11, AMCU took a strike vote at the Sibanye facilities, although leaders claim they will not walk out until negotiating possibilities have been exhausted. AMCU has its largest membership at Sibanye; none of the unions at the mine have an outright majority. NUM, Solidarity and the United Association of South Africa signed a three-year pay agreement with AngloGold Ashanti and Harmony on Oct. 2. Nonetheless, AMCU was issued a certificate of nonresolution by the Council for Conciliation, Mediation and Arbitration. Mine owners intend to take legal action against AMCU if they proceed with a strike in an attempt to have any work stoppage declared unprotected. AMCU’s lack of a majority representation will be used by the bosses to try to win an injunction forcing the union members back to work. South Africa’s gold output has fallen 39 percent from a June 2011 high, and the largest firms, whose mines are the deepest and among the oldest globally, say they are losing money on about 35 percent of production at current price levels. South Africa is the world’s largest source of platinum. Its production has been down overall this year. 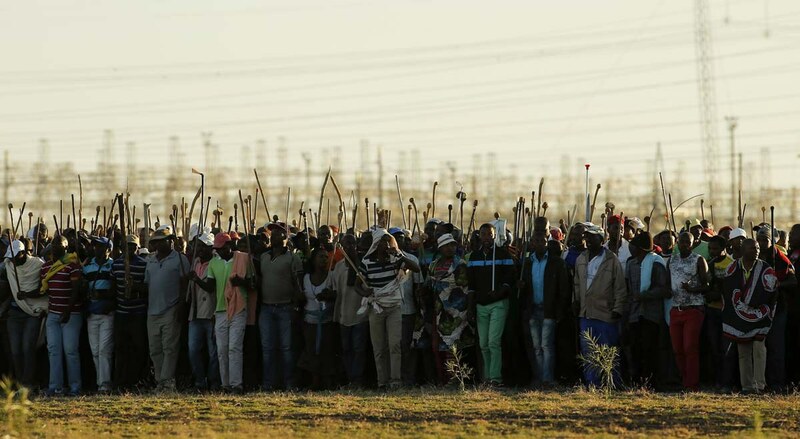 In 2014, AMCU led the longest strike in the history of the mining industry, resulting in lower production and slowing of growth inside the country. It was in the platinum sector that the Marikana strike took place in August 2012, leading to the deaths of more than 11 union organizers and workers who were killed in internecine conflicts between supporters of NUM and AMCU. During the strike, the Northwest provincial police carried out a massacre of miners on Aug. 16; 34 were killed and many other injured. The International Monetary Fund recently released its forecast for growth in South Africa, saying there was the potential for a 1.4 percent increase in 2015, revising downward its previous prediction of 2 percent. IMF officials also warned that in 2016, the growth rate would be 1.3 percent, revising an earlier forecast of 2.1 percent. A World Bank report examining the potential for economic growth in South Africa and throughout the continent as a whole also scaled back growth figures for 2015 and 2016. It predicted a 1.5 percent growth rate for 2015 and 1.7 percent for the following year. Rates for sub-Saharan Africa were forecast to decline from 4.6 percent in 2014 to 3.7 percent for 2015, the lowest since 2009. Predictions of slower growth indicate that Africa would be the only developing region to fall below the United Nations global poverty reduction goals.